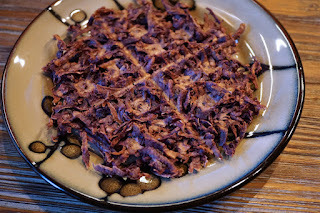 FatFreeVegan.com reminded me of making shredded potatoes in the waffle iron. I still have some Hawaiian purple potatoes left, so I decided to try those. Came out GREAT! Just shredded potatoes...NO OIL! Just heat up your waffle iron, place the shredded potatoes on the surface of the iron, close tightly, and leave it there for 15 minutes! Crispy and delish! Were the potatoes cooked first then put on the waffle iron? Paula...They were raw. 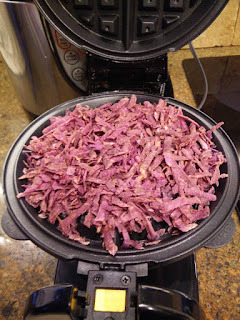 Purple sweet potatoes are drier and work really well.